After contemplating the presence of Koster and Bial’s “The Corner” building on 6th and 24th Streets miraculously still standing after 123 years despite the utter transformation of the rest of 6th Avenue (as of 2011; for me, the years now seem like science fiction; we aren’t on Mars, as some have marveled about, but we can now contact practically everyone we ever knew in an instant now). As I write this rambling discourse I’m listening to a British rocker named Julian Cope, who is fascinated with the megaliths of prehistoric England, such as Stonehenge. I too am fascinated by the things that hang on for year after year, unchanging, almost immutable. I gravitated to West 22nd, just east of 6th Avenue, remembering an old pal I had not greeted for awhile, who we will meet presently. 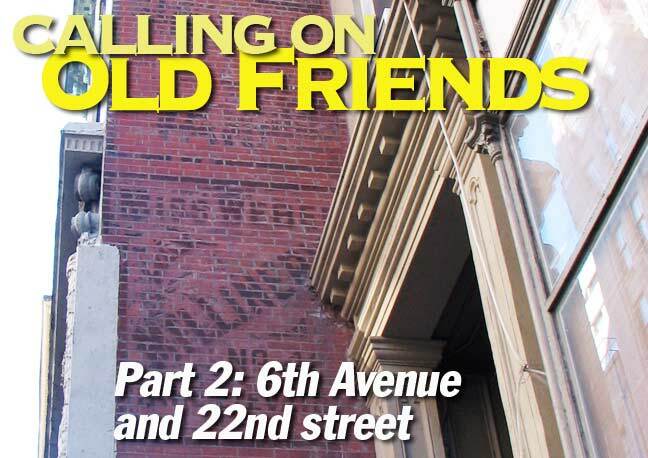 My “pal” resides at 48 West 22nd, which is part of a trio of old turn of the 19th-20th Century buildings, designed with the casual elegance and excellence of the era, from left to right, 44, 46 and 48th. 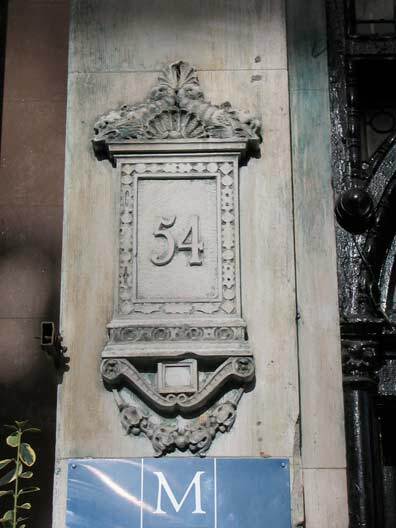 Note the curved arch on #48 (it looks like a building on 6th Avenue you can see on the link to 6th and 24th Street above). 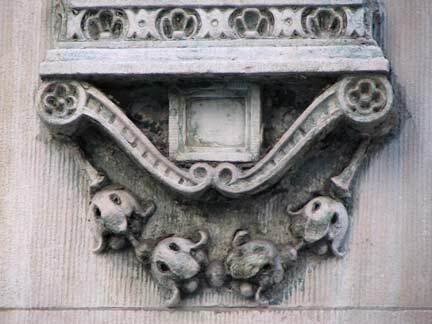 There’s also those terra cotta medallions near the roof that only folks in the building across the street could get a good look at. 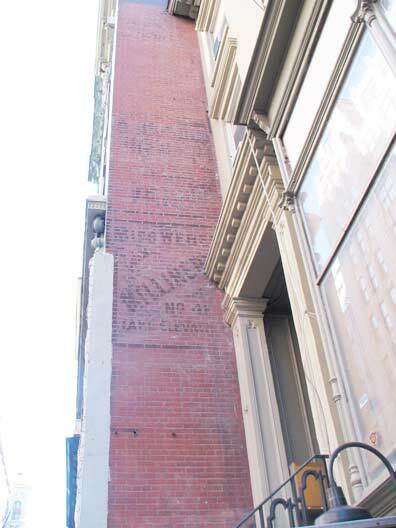 48 West 22nd was likely constructed some years after its brethren to its west and east, since it juts out a bit into the sidewalk; this provided a built-in billboard and advertising space for any businesses that wished to take advantage of that. 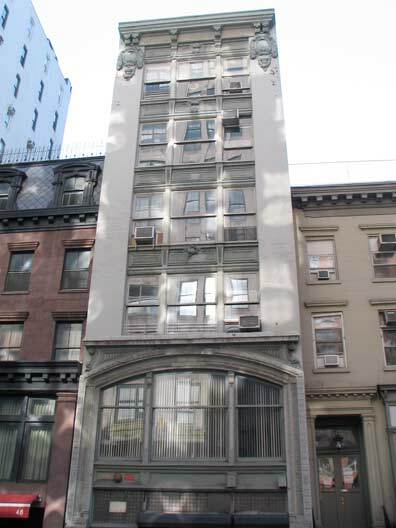 A Miss Weber and her millinery shop was once such tenant at 48 West 22nd that did just that. A milliner is a fancy word for a business that sells women’s hats, and few women in the Western Hemisphere were seen outdoors without hats from perhaps the Age of the Reformation until the dawn of the Casual Era, which, I’d say, was about 1954, when they began to be seen for formal occasions only. You hear a lot about how men discarded their business hats in droves beginning in the late 50s and early 60s, but take a look at any photo of Manhattan taken outdoors, until ’54 or so, and very few, if any, of the women are without their chapeaux, even in the summer. So, hats were a big, big business, one that has declined precipitously. I notice more hats lately, though, as the myth that heat escapes via the head has taken hold in recent years, and virtually everyone has some sort of lid on during the cold months, at least. 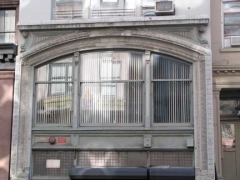 Ida L. Weber (1879-1932) kept a millinery shop here at 48 W. 22 St. from 1911 to 1913. 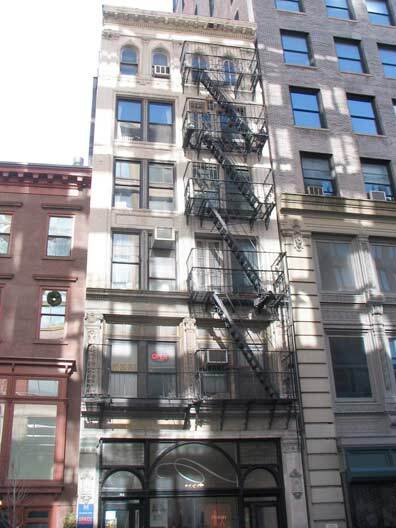 In 1913 she moved to 66 W. 39 St. in New York’s Millinery District and stayed there until going out of business around 1922/23. 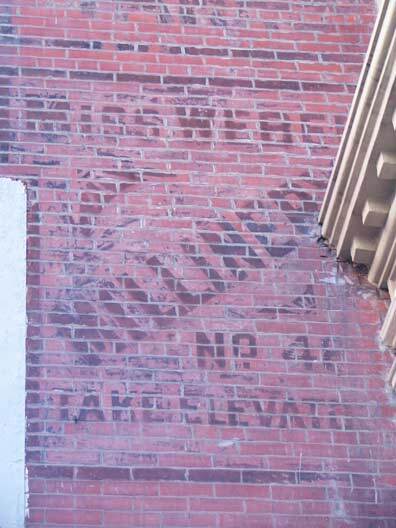 That’s correct — this painted ad, which will celebrate its centennial this year, remembers a business that was located on the street for just two years. A bistro on the ground floor at 50 West 22nd had a table out front, on which I found two vintage coffee cans sitting there. Both these businesses are still going strong, but these designs go back as far as the 1960s, and perhaps earlier than that. 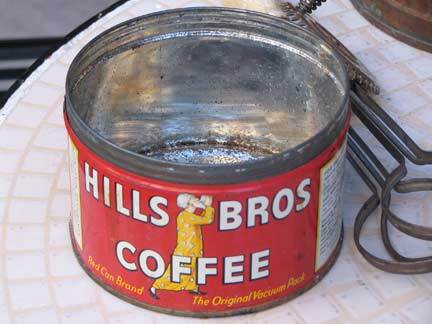 Hills Brothers was founded in 1823. The “taster” character made his debut on the label in 1906. 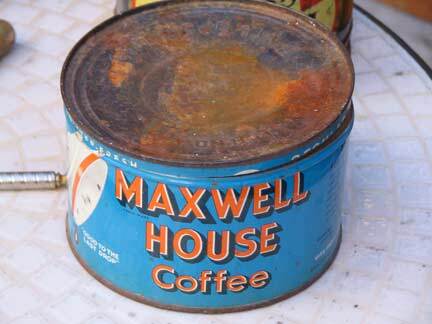 Maxwell House, named for the Tennessee hotel where it debuted, was founded in 1892 and remains the second best selling coffee in the USA behind Folgers. Your webmaster estimates that I have drank about 10-15 cups of coffee, tops, in my life. 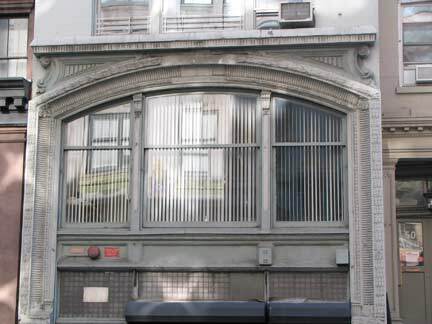 Don’t know much about 54 West 22nd, except for the fine glass arched panels above the door, as well as the fantastical entablatured house numbers, in a pair on both sides of the building. 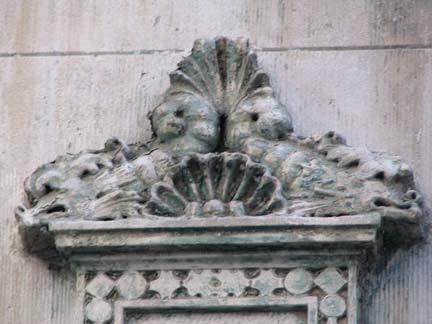 At the top are carven dragon heads or fish-things, much weathered over the years, while at the bottom, are four delicate flowers per house number. As I explored on my Deep Sixth page a few years ago, the “Ladies’ Mile” stretch of 6th Avenue between West 17th and 23rd Streets is lined on both sides with the shells of one-immense department stores, which have since been put to other uses since their heyday faded and shopping moved uptown. 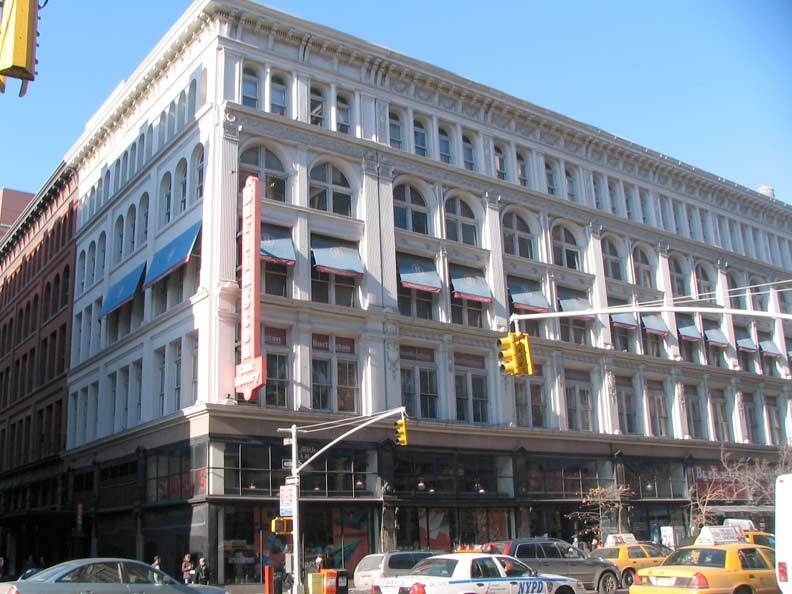 At 22nd and 6th is the former Ehrich Brothers Emporium, constructed in 1889, and currently home to a Burlington Coat Factory on the ground floor. But there’s a secret about this building that most passersby fail to notice. 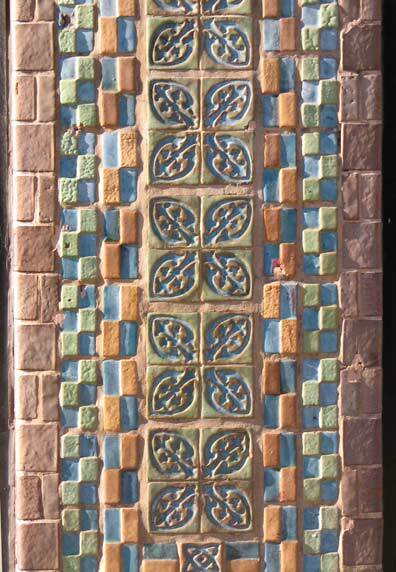 The exterior of the building is festooned with letter K’s, both on the beautifully colored terra cotta paneling, and also on the wrought iron decorations. As is well known, “Ehrich” doesn’t begin with K, so why all the K’s? 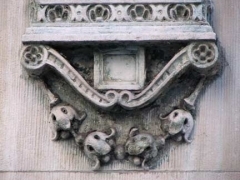 This dates to the era when the building was owned by Chicago merchants J.L. 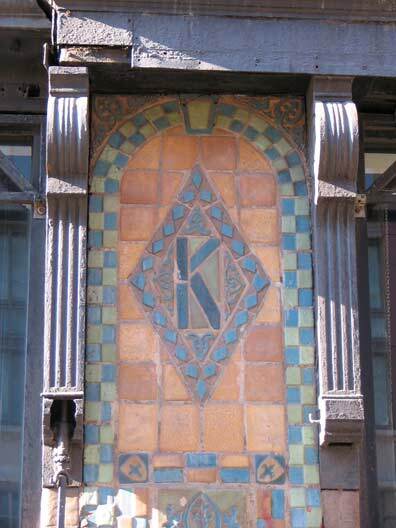 Kesner Company, who hired architects Taylor and Levi to add all the letter K’s, which remind me both of the subway signage being designed by Heins and LaFarge at the time and also looking forward to the Machine Age mosaic lettering that came about in the late 1920s. 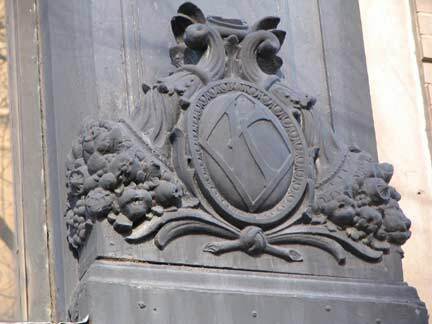 The kicker in all this is: what year did Kesner Co. purchase the building? 1911. 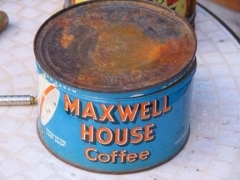 What year did they sell? 1913. Giving the Kesner K’s and Miss Weber’s Millinery a connection of centennial coincidence!